Geo Knight have announced an addition to their product line and have launched the DK 32, a manual 26"x 32" ,medium format heat press. 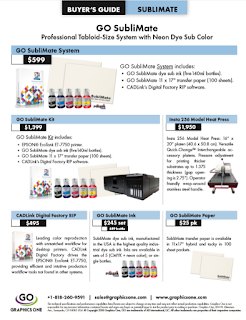 The unit is priced at $6,195 and appears to be only available through Conde, a well known and successful dye sublimation product provider. This unit is aimed at the same market as the Metalnox EL 900, a 27.5"x 43" manual heat press priced at $6,495. The EL 900 offers far more value with 42% more platen space than the Knight DK 32. Graphics One will soon provide a comparison between the Metalnox EL 900 and the Knight DK 32 medium format manual heat presses. For added info about the Metalnox product line, and more specifically the EL 900, please go to: Metalnox EL 900 Info.